NASA's fleet of ocean color satellites have provided an enduring times series of phytoplankton chlorophyll concentration of a quality sufficient for a climate data record. Following on from SeaWiFS and MODIS missions, the Pre-Aerosol, Cloud, ocean Ecosystem (PACE) mission is designed to fulfill the climate continuity requirements, with a launch readiness in the time frame of 7 years. 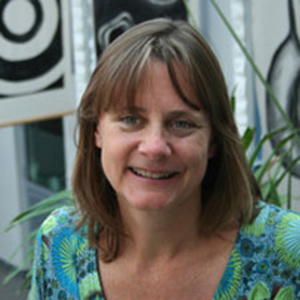 Beyond the estimation of phytoplankton chlorophyll concentration, the goals of PACE are to provide climate-quality global ocean color measurements that are essential for understanding the carbon cycle and global ocean ecology and determining how the ocean's role in global biogeochemical (carbon) cycling and ocean ecology both affects and is affected by climate change. Among the improvements for the ocean color specifications are increased spectral and spatial resolution. One of the specific objectives of the PACE mission is the retrieval of the inherent optical properties (IOPs), absorption and backscattering, via ocean color inversion algorithms. The capability for retrieving spectral phytoplankton absorption coefficients is key to addressing questions of carbon cycling and ocean ecology as these coefficients provide not only an estimate of algal concentration (that can be linked by proxy to algal carbon) but also to algal composition via pigment-based taxonomic discrimination. Pigment-based taxonomic composition provides a key approach to defining phytoplankton functional types (PFTs) as many of the pigment-based lineages coincide with biogeochemical niches, calcifiers, silicifiers, nitrogen fixers, etc. 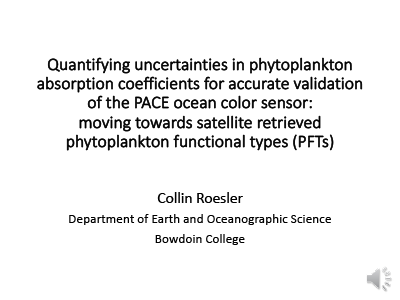 One challenge for the PACE mission is to define robust protocols with quantified uncertainty terms for constructing validation data sets for phytoplankton absorption. While in situ optical technologies exist to measure hyperspectral absorption on the spatial and temporal scales approaching those required for satellite validation, extracting the signature associated solely with phytoplankton cannot currently be performed analytically and thus we rely on model estimates. Measuring phytoplankton absorption requires collection of discrete water samples, collecting the particles on glass fiber filters to remove the optical contribution by colored dissolved organic matter (CDOM), and measuring the absorption spectrophotometrically before and after pigment extraction. The absorption by the phytoplankton pigments in vivo is calculated by difference. However, the filter pad contaminates the signal due to its strong scattering properties and additionally amplifies the optical pathlength of transmitted photons in the spectrophotometer. These two error sources are inadvertently combined into a single correction factor, beta, called the pathlength amplification factor. Many researchers over the years have investigated this factor using a variety of strategies and technologies and yet it remains the largest source of uncertainty in the quantification of phytoplankton absorption. Unfortunately, models for extracting the phytoplankton absorption from in situ observations of whole water or particulate absorption are based upon laboratory investigations in which beta was poorly constrained at worst, or at best for which the uncertainties were not quantified. 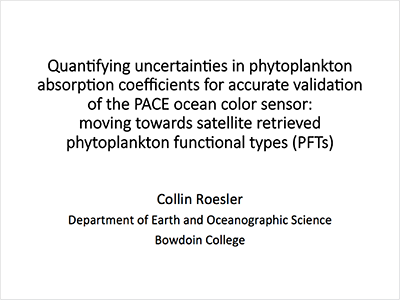 Thus in order to address the need for ocean color validation of phytoplankton absorption coefficients, a unified approach linking the quantitative filter pad technique to continuous in situ absorption observations is required and is the primary focus of this proposal. 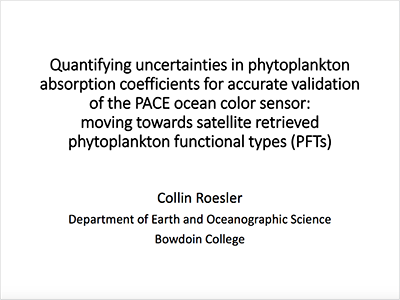 The secondary focus of this proposal is to investigate whether multispectral chlorophyll fluorescence can provide a quantitative proxy for phytoplankton absorption at the excitation wavelengths. This approach would expand the opportunities for in situ phytoplankton absorption validation by making use of a simple, economical, easily deployed technology that does not require the same level of optical expertise as absorption technologies. Xing, X., Claustre, H., Boss, E., Roesler, C., Organelli, E., Poteau, A., Barbieux, M., and D'Ortenzio, F. (2016). Correction of Profiles of In-situ Chlorophyll Fluorometry for the Contribution of Fluorescence Originating from Non-algal Matter, Limnol. Oceanogr. Methods, 15, 80-93, doi: 10.1002/lom3.10144. Roesler, C. and Culbertson, C. (2016). Lake Transparency: A Window into Decadal Variations in Dissolved Organic Carbon Concentration in Lakes of Acadia National Park, Maine, In P.M. Glibert, T.M. Kana (eds. ), Aquatic Microbial Ecology and Biogeochemistry: A Dual Perspective, Springer, pp. 225-236, DOI 10.1007/978-3-319-30259-1_18. Roesler, C.S. (2015). Hourly, Daily and Seasonal Climatology of In Situ Chlorophyll Fluorescence Observations on NERACOOS Mooring A01 and Comparison with Satellite-derived Chlorophyll Estimates, Massachusetts Water Resources Authority, Environmental Quality Department, 2015-07. Thibodeau, P., Roesler, C.S., Drapeau, S., Matondkar, P., Goes, J.I., and Werdell, P.J. (2014). Locating Noctiluca miliaris in the Arabian Sea: An Optical Proxy Approach, Limnology and Oceanography, 59, doi: 10.4319/lo.2014.59.6.2042. Kramer, S. and Roesler, C. (2014). Phytoplankton and Nitrate in Harpswell Sound: A Multi-scale Investigation, Ocean Opt. XXII, doi: 10.13140/RG.2.1.2552.7925. Nardelli, S. and Roesler, C. (2014). Using Data from the LISST-100 to Recreate Phytoplankton Size Distribution and Processes in Harpswell Sound, Maine, Ocean Opt. XXII, doi: 10.13140/RG.2.1.1405.2564. Werdell, P.J., Roesler, C.S., and Goes, J.I. (2014). Discrimination of Phytoplankton Functional Groups Using an Ocean Reflectance Inversion Model, Appl. Opt. 53, 4833-4849, doi: 10.1364/AO.53.004833. Sathyendranath, S., Alvain, S., Bracher, A., Hirata, T., Lavender, S., Raitsos, D., and Roesler, C.S. (2014). Remote Sensing Algorithms for Multiple Phytoplankton Types, Sathyendranath, S. and Stuart, V. (eds. ), Phytoplankton Functional Types from Space, Reports of the International Ocean-Colour Coordinating Group (IOCCG), 15, Dartmouth, Nova Scotia, Canada: IOCCG, Ch. 5, ISBN: ISSN 1098-6030. Roesler, C.S. and Barnard, A.H. (2013). Optical Proxy for Phytoplankton Biomass in the Absence of Photophysiology: Rethinking the Absorption Line Height, Meth. Oceanog.7, 79-94, doi: 10.1016/j.mio.2013.12.003. 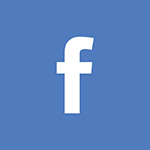 Sauer, M.J. and Roesler, C.S. (2013). Unraveling Phytoplankton Optical Variability in the Gulf of Maine During the Spring and Fall Transition Period, Cont. Shelf Res. 61-62, 125-136, doi: 10.1016/j.csr.2013.04.009. Sauer, M.J., Roesler, C.S., Werdell, P.J., and Barnard, A.H. (2012). Under the Hood of Satellite Empirical Chlorophyll a Algorithms: Revealing the Dependencies of Maximum Band Ratio Algorithms on Inherent Optical Properties, Opt. Express, 20(19), 20920-20933 doi: 10.1364/OE.20.020920. Estapa, M., Boss, E., Mayer, L.M., and Roesler, C.S. (2011). Role of Iron and Organic Carbon in Mass-specific Light Absorption by Particulate Matter from Louisiana Coastal Waters, Limnol. Oceanogr. 57(1), 97-112, doi: 10.4319/lo.2012.57.1.0097. Proctor, C.W. and Roesler, C.S. (2010). New Insights on Obtaining Phytoplankton Concentration and Composition from In Situ Multispectral Chlorophyll Fluorescence, Limnol. Oceanogr. Methods, 8, 695-708, 10.4319/lom.2010.8.0695. Slade, W.H., Boss, E., Dall'Olmo, G., Langner, M.R., Loftin, J., Behrenfeld, M.J, Roesler, C., and Westberry, T.K. (2010). Underway and Moored Methods for Improving Accuracy in Measurement of Spectral Particulate Absorption and Attenuation, J. Atmos. Oceanic Tech. 27(10), 1733-1746, doi: 10.1175/2010JTECHO755.1. Aurin, D.A., Dierssen, H.M., Twardowski, M.S., and Roesler, C.S. (2010). Optical Complexity in Long Island Sound and Implications for Coastal Ocean Color Remote Sensing, J. Geophys. Res., 115, C07011, doi: 10.1029/2009JC005837. Pettigrew, N., Roesler, C., Neville, F., and Deese, H. (2008). An Operational Real-Time Ocean Sensor Network in the Gulf of Maine, Nittel, S., Labrinidis, A., and Stefanidis, A. (eds.) GeoSensor Networks. Lecture Notes in Computer Science, Berlin Heidelberg: Springer, 213-238, doi: 10.1007/978-3-540-79996-2_12. Roesler, C.S. and Boss, E. (2008). In situ Measurement of the Inherent Optical Properties (IOPs) and Potential for Harmful Algal Bloom (HAB) Detection and Coastal Ecosystem Observations, Babin, M., Roesler, C.S., and Cullen, J. (eds. ), Real-time Coastal Observing Systems for Marine Ecosystem Dynamics and Harmful Algal Blooms: Theory, Instrumentation and Modelling, Paris: UNESCO, Ch. 5, 153-206. Babin, M., Roesler, C.S., and Cullen, J.J. (eds.) (2008). Real-Time Coastal Observing Systems for Ecosystem Dynamics and Harmful Algal Blooms, UNESCO Series Monographs on Oceanographic Methodology, 830 p., 978-92-3-104042-9. Pettigrew, N.R., Xue, H., Irish, J.D., Perrie, W., Roesler, C.S., Thomas, A.C., and Townsend, D.W. (2008). The Gulf of Maine Ocean Observing System: Generic Lessons Learned in the First Seven Years of Operation (2001-2008), Marine Tech. Soc. J., 42(3), 91-102. Boss, E. and Roesler, C.S. (2006). Over Constrained Linear Matrix Inversion with Statistical Selection, Lee, Z.P. (ed. ), Remote Sensing of Inherent Optical Properties: Fundamentals, Tests of Algorithms, and Applications, IOCCG, Report #5, Ch. 8, 42-46. Pettigrew, N.R. and Roesler, C.S. (2005). Implementing the Gulf of Maine Ocean Observing System, Europe Oceans 2005, 2, 1362-1369, doi: 10.1109/OCEANSE.2005.1513259. Peng, W., Boss E., and Roesler, C.S. (2005). Uncertainties of Inherent Optical Properties Obtained from Semi-analytical Inversions of Ocean Color, Appl. Opt., 44(19), 4074-4085, doi: 10.1364/AO.44.004074. Babin, M., Cullen, J.J., Roesler, C.S., Donaghay, P.L., Doucette, G.J., Kahru, M., Lewis, M.R., Scholin, C.A., Sieracki, M.E., and Sosik, H.M. (2005). New Approaches and Technologies for Observing Harmful Algal Blooms, Oceanogr., 18(2), 210-227, doi: 10.5670/oceanog.2005.55. Belzile, C., Vincent, W.F., Howard-Williams, C., Hawes, I., James, M., Kumagai, M., and Roesler, C.S. (2004). Relationships Between Spectral Optical Properties and Optically Active Substances in a Clear Oligotrophic Lake, Water Resour. Res., 40(W12512), doi: 10.1029/2004WR003090. Etheridge, S.M. and Roesler, C.S. (2004). Temporal Variations in Phytoplankton, Particulates, and Colored Dissolved Organic Material Based on Optical Properties During a Long Island Brown Tide Compared to an Adjacent Embayment, Harmful Algae, 3, 331-342, doi: 10.1016/j.hal.2004.06.005 . Simeon, J., Roesler, C., Pegau, W.S., and Dupouy, C. (2003). Sources of Spatial Variability in Light Absorbing Components Along an Equatorial Transect from 165°E to 150°W, J. Geophys. Res., 108, 3333, doi: 10.1029/2002JC001613, C10. Roesler, C.S. and Boss, E. (2003). Spectral Beam Attenuation Coefficient Retrieved from Ocean Color Inversion, Geophys. Res. Lett., 30, 1468, doi:10.1029/2002GL016185, 9. Werdell, P.J. and Roesler, C.S. (2003). Remote Assessment of Benthic Substrate Composition in Shallow Waters Using Multispectral Reflectance, Limnol. Oceanogr. 48, 557-567. Roesler, C.S., Etheridge, S.M., and Pitcher, G.C. (2002). Application of an Ocean Color Algal Taxa Detection Model to Red Tides in the Southern Benguela, Steidinger, K.A., Lansdberg, J.H., Tomas, C.R., and Vargo, G.A. (eds. ), Harmful Algae 2002, Florida Fish and Wildlife Conservation Commission, FIOIOC of UNESCO, 303-305, doi: 10.13140/2.1.3772.0648. Bricaud, A., Roesler, C., Ishizaka, J., and Parslow, J. (2002). Bio-optical Studies During the JGOFS-Equatorial Pacific Program: A Contribution to the Knowledge of the Equatorial System, Deep Sea Res. 49(13), 2583-2599, doi: 10.1016/S0967-0645(02)00049-8. Gardner, W.D., Blakey, J.C., Walsh, I.D., Richardson, M.J., Pegau, S., Zaneveld, J.R.V., Roesler, C., Gregg, M.C., MacKinnon, J.A., Sosik, H.M., and Williams III, A.J. (2001). Optics, Particles, Stratification, and Storms on the New England Continental Shelf, J. Geophys. Res., 106(C5), 9473-9497, doi: 10.1029/2000JC900161. Sosik, H.M., Green, R.E., Pegau, W.S., and Roesler, C.S. (2001). Temporal and Vertical Variability in Optical Properties of New England Shelf Waters During Late Summer and Spring, J. Geophys. Res., 106(C5), 9455-9472, doi: 10.1029/2000JC900147. Schofield, O., Grzymski, J., Bissett, W.P., Kirkpatrick, G., Millie, D.F., Moline, M., and Roesler, C.S. (1999). Optical Monitoring and Forecasting Systems for Harmful Algal Bloom: Possibility or Pipe Dream?, J. Phycol., 35, 1477-1496, doi: 10.1046/j.1529-8817.1999.3561477.x. Leathers, R.A., Roesler, C.S., and McCormick, N.J. (1999). Ocean Inherent Optical Property Determination from In-water Light Field Measurements, Appl. Opt. 38(24), 5096-5103, doi: 10.1364/AO.38.005096. Roesler, C.S. and McLeroy-Etheridge, S.L. (1998). Remote Detection of Harmful Algal Blooms, SPIE Ocean Opt. XIV, 117-128. McLeroy-Etheridge, S.L. and Roesler, C.S. (1998). 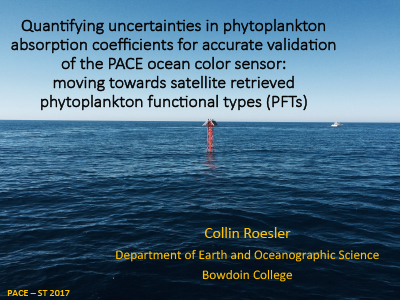 Are the Inherent Optical Properties of Phytoplankton Responsible for the Distinct Ocean Colors Observed During Harmful Algal Blooms?, Ocean Opt. XIV, 109-116. Roesler, C.S. (1998). Theoretical and Experimental Approaches to Improve the Accuracy of Particulate Absorption Coefficients from the Quantitative Filter Technique, Limnol. Oceanogr., 43(7), 1649-1660, doi: 10.4319/lo.1998.43.7.1649. Ciotti, A.M., Cullen, J.J., Roesler, C.S., and Lewis, M.R. (1997). Influence of Phytoplankton Size Structure on the Spectral Attenuation Coefficient in the Upper Ocean, Ocean Opt., XIII, 380-385, doi: 10.1117/12.266471. Roesler, C.S. and Perry, M.J. (1995). In Situ Phytoplankton Absorption, Fluorescence Emission, and Particulate Backscattering Spectra Determined from Reflectance, J. Geophys. Res., 100(C7), 13279-13294, doi: 10.1029/95JC00455. Bricaud, A., Roesler, C.S., and Zaneveld, J.R.V. (1995). In Situ Methods for Measuring the Inherent Optical Properties of Ocean Waters, Limnol. Oceanogr., 40(2), 393-410, doi: 10.4319/lo.1995.40.2.0393. Roesler, C.S. and Zaneveld, J.R.V. (1994). High-resolution Vertical Profiles of Spectral Absorption, Attenuation, and Scattering Coefficients in Highly Stratified Waters, Ocean Opt., XII, 309-319, doi: 10.1117/12.190074 . Iturriaga, R., Morel, A., Roesler, C., and Stramski, D. (1991). Individual and Bulk Analysis of the Optical Properties of Marine Particulates: Examples of Merging These Two Scales of Analysis, Demers, S. (ed. ), Particle Analysis in Oceanography, Springer: Berlin Heidelberg, 339-347. Roesler, C.S., Perry, M.J., and Carder, K.L. (1989). Modeling In Situ Phytoplankton Absorption from Total Absorption Spectra, Limnol. Oceanogr., 34, 1512-1525, doi: 10.4319/lo.1989.34.8.1510.